This spring, the South Central Area Health Education Center (SC AHEC) at WKU funded after-school health career exploration clubs at Clinton County Middle School and Clinton County High School. The clubs, named the White Coats Club for Future Medical Professionals, focused on health career promotion and exploration. 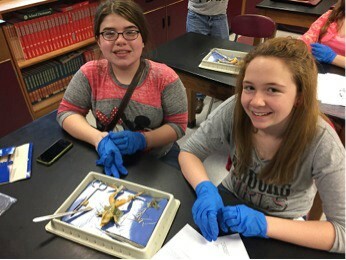 Middle school students focused on dissection labs, completing worm, owl pellet, frog and fetal pig dissections. High school students completed more complex labs covering topics such as diffusion, genetics and cellular respiration. Both clubs were visited by guest speakers from the medical field including a surgeon, dentist, nurse and physical therapy assistant. In total, the two clubs reached close to 50 students. To view photos from the clubs, visit http://www.wku.edu/scahec/hc_clubs_photos.php. The SC AHEC is dedicated to promoting health careers to students of all ages. They are actively looking for schools or organizations to partner with for the 2015-2016 academic year. If your school would like to host a health careers exploration club or a different health careers program, contact Catherine Malin.